Pokemon GO Unown Pokemon was introduced in Generation 2, each Unown Letter represent a character from the alphabet. 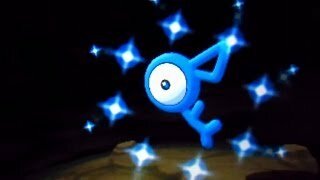 There are no Unown Letter Pokemon Evolutions at the moment. They are also known to be extremely rare Pokemon who live in their own dimension. Often circling around each other spelling out words or ancient text. Shiny Version of these Pokemon have a bluish tint when compared with the regular type.